The process to obtain a FedRAMP/Risk Management Framework (RMF) Authority To Operate (ATO) is very time consuming, manual, and paper-intensive. Until now! Introducing ATO as a Service™, an innovative Software as a Service (SaaS) that expedites FedRAMP/RMF processes, auto-generates authorization package documents, and automates continuous monitoring for your Microsoft Cloud-hosted information systems. cFocus Software has partnered with Microsoft Corporation to develop ATO as a Service™, allowing us to integrate best-of-breed cloud and continuous monitoring automation technology. FedRAMP is quite a time-consuming process! A recent report on the FedRAMP market states that even after years of streamlining, the average time to obtain a FedRAMP Joint Authorization Board ATO is still 6 months. ATO as a Service™ features a rich user experience that expedites FedRAMP/RMF authorizations through automation. Each FedRAMP process area (Document, Assess, Authorize, & Monitor) is presented through a step-by-step wizard that incorporates all applicable FedRAMP/RMF instructions & templates and guides you to completion. FedRAMP authorization package documents are famously large and labor-intensive—a System Security Plan can easily include 500+ security controls in a 1000+ page document! FedRAMP stakeholders must manually respond to each security control and manage each document, which adds significant overhead to the FedRAMP authorization process. ATO as a Service™ automates FedRAMP/RMF data collection and auto-generates authorization package documents (such as the System Security Plan, POA&Ms list, etc.) for you. Through our collaboration with the Microsoft Azure Blueprint program, ATO as a Service™ automatically provides implementation responses to common controls inherited from Microsoft Azure, and also provides guidance on how to write a thorough and compliant implementation response for security controls that are your responsibility. ATO as a Service™ was specifically designed to automate FedRAMP continuous monitoring requirements for Microsoft Cloud-based information systems. ATO as a Service™ provides operational visibility of security controls, manages system change control, and manages incident responses at both the system-level and organization-level with custom dashboards and security control management modules. ATO as a Service™ also orchestrates best of breed continuous monitoring tools from Microsoft and Tenable for you. By integrating Microsoft Azure technologies (such as Desired State Configuration, Azure Automation, Log Analytics, etc. ), and by integrating Tenable technologies (such as Nessus and SecurityCenter), ATO as a Service™ can automate and manage many continuous monitoring activities on your behalf. FedRAMP authorizations requires an extraordinary amount of detail. 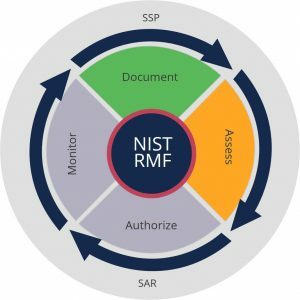 In fact, FedRAMP stakeholders are often so focused on the details of each authorization at a micro-level, they seldom have the opportunity to analyze the overall FedRAMP security posture of the organization at a macro-level. ATO as a Service™ affords you the opportunity to analyze your overall FedRAMP security posture in the Microsoft Cloud at an organizational level. Through a single pane of glass, ATO as a Service™ can aggregate initial and ongoing authorization details for all of your Microsoft Cloud-based information systems, revealing trends and insights that help you to make better risk-based policy decisions. ATO as a Service™ also incorporates Microsoft Machine Learning and predictive analytics capabilities that analyzes your system logs for emerging threat patterns, and subsequently makes recommendations on the best security controls to implement to mitigate the risk associated with these threats.